Do animals play? Do they dance? 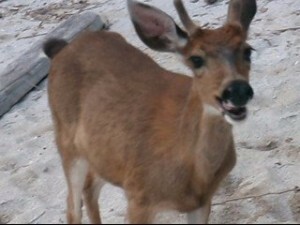 Do deer get lonely when isolated and beg for a friend to play with? 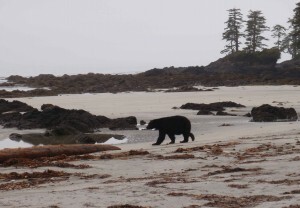 My visit to British Columbia’s Bunsby Islands raises those questions. I should back up a few steps and explain. I love to visit wilderness areas. That wild and vast playground is my place for adventure, challenge and awe. I get an amazing “reset” with every adventure – refreshed and renewed. Lately, I’ve been exploring the remote and roadless west coast of BC’s Vancouver Island by sea kayak. 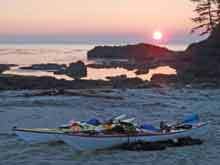 The island is a fantastic playground and travel by sea kayak is a great way to play. 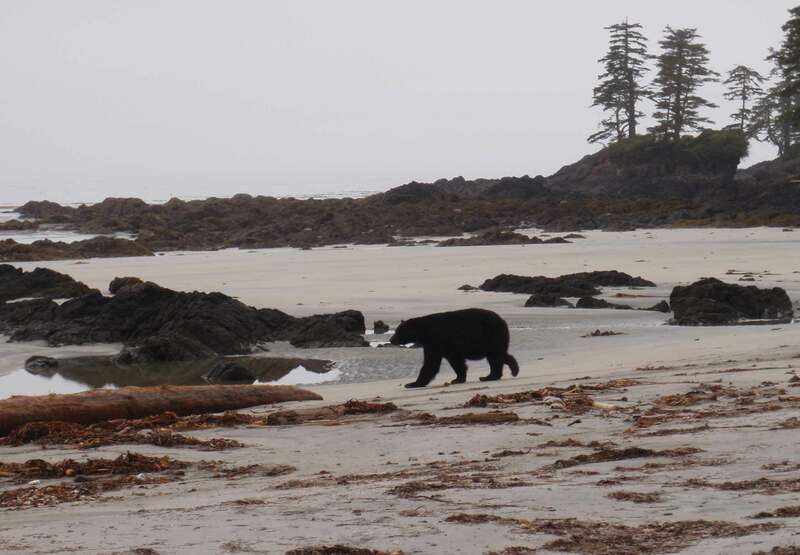 Since it has such poor road and vehicle access, much of Vancouver Island’s west coast exists in an undisturbed state where visitors can find old growth forests and beaches traveled by wolves and bears. Ocean meets land to form a coastal wilderness unlike anything in our lower 48. In one of those outings I visited a cluster of islands called the Bunsby Islands, combining it with a tour around Brooks Peninsula. 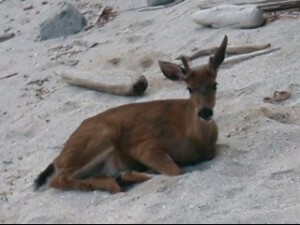 prepared and ate dinner and were relaxing on a shell beach when a deer approached us. Island 195 is small – it’s only a few acres in size, and it’s cliffy and steep, so I was surprised to find a deer on the island. But deer are known to be competent swimmers and there’s only a short stretch of open water between the Bunsby’s and Vancouver Island, so why not? This deer had made the journey. My surprise at being approached by the deer grew to astonishment as it walked to within a few feet, bowed down in the classic canine “play pose” (it resembles Yoga’s downward dog pose), pulled its lips back in what resembled a maniacal grin, and then abruptly leaped upward several feet. 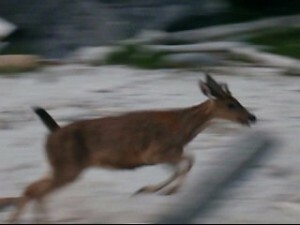 I was slack jawed as the deer landed, pivoted and then raced around the beach in a figure 8 for a few laps, only to approach again, drop into the play pose, leap upward, and then race in more figure 8’s on the beach. The deer repeated this several times, each time approaching in the play pose, and by now panting for breath and making odd grunting sounds. This animal was getting quite a workout and expending a lot of precious energy… for what purpose? The answer to that question is still a little murky to me. I’m not completely sure about exactly what the play pose meant. And the upward leap that I thought of as dancing – what was that? Stotting? And then there’s the multiple approaches and the running. What was this deer doing? The best answer I can find to that question comes from the primal familiarity I felt inwardly. There was something in this cross-species communication that felt oddly familiar. I had a primal sense that I deeply knew my reciprocal role in this, what should I even call it, an invitation? To play? The deer’s behavior did remind me of human play and also of the way our canine friends play with each other and with their human companions. I felt my own urge to abandon sensible thoughts, to run and leap. To join in the play. To understand my experience, I’m thinking about the emotional and autonomic nervous system structures that we humans share with other mammals, and I’m considering the familiarity that we might feel across species due to those shared structures. Scientists like Dacher Keltner at UC Berkeley, Pascal Vrticka at Max Plank Institute, and Stephen Porges at the University or North Carolina point out that our social nervous system evolved from structures that were most likely present in phylogenetically earlier animals and serve a similar function in their descendants. These structures are active when we affiliate and bond with each other. The affiliating and bonding those structures are active in creates more beneficial and stronger bonds between us and contributes to greater levels of individual and social wellbeing. One of these structures, the Ventral branch of the Vegus Nerve, has even been called by Stephen Porges “the love nerve” for its role in compassion and empathy. “Other species have been shown to play with other species,” Dacher Keltner observed in a recent edX lecture titled “Play and the Pursuit of Happiness.” Was this other species simply inviting me to come out and play? To join in the play and pursue more happiness? After a few repeats of the play pose and running, it occurred to me that this could go on for a while. I had time to go get my camera and shoot some video. But by the time I started to record, the approach, play pose, and jump behavior had ended and the deer was merely running around us on the beach (short video here). Eventually the deer tired and lay down near us, chest heaving for breath and without fear. We watched each other for a while, and then he stood up and slowly wandered away into the trees. I felt a touch of sadness seeing him go. Writing about this encounter now, far from that wilderness beach and back in my familiar world, I’m mulling over play and awe. 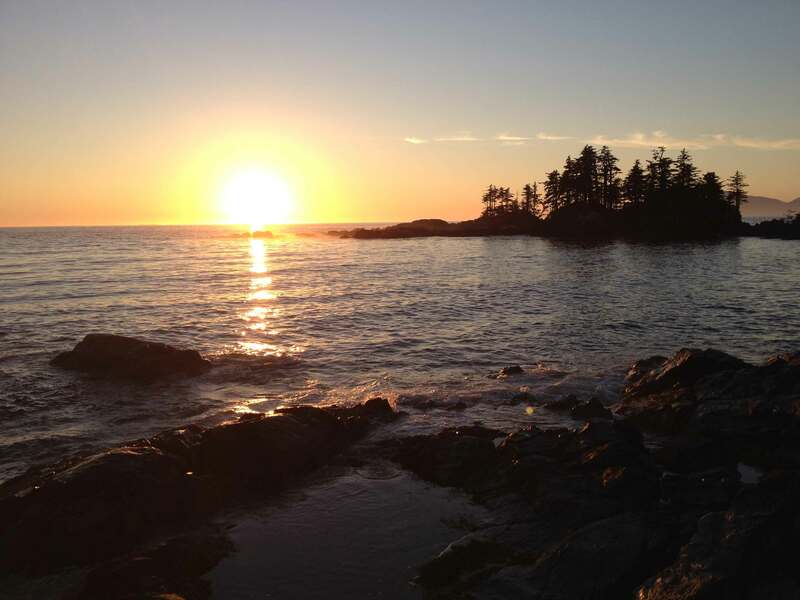 I experienced awe every day on that Vancouver Island kayak trip. Philosophers have a word for the awe-evoking beauty found in wild settings: sublime. It refers to a quality of grandeur that goes beyond being beautiful and stretches into something that our minds can’t quite measure or contain. The grandeur, vastness, and complexity of those places evokes a quality of renewal that I take home with me. It reminds me of a John Muir quote, “Everybody needs beauty…places to play in and pray in where nature may heal and cheer and give strength to the body and soul alike.” Muir’s advice works well for me – I find strength for my soul in my wilderness outings. Awe anyone? North Brooks Peninsula Sunset. Being invited to play created a feeling of connection. In this case, the connection was oddly meaningful because it was across species and from an unlikely source. I expect my friend’s dog to engage with me and invite play, but really, a deer?! They usually bolt and run. Scientists who study play point out that one of its benefits is the sense of connection and bonding that we feel with our fellow playmates. Those feelings are positive and increase happiness while creating the social resources that contribute to our thriving. Alan Leslie at London University has even proposed that play is a gateway to developing empathy and understanding for other people’s perspectives which is essential to human relations, to compassion, and ultimately to relational happiness. So, not only does play feel good while we do it, but it also trains the very skills that are essential for creating satisfying relationships that feel good long after the play is over. Play develops other capacities as well. In his 2009 book “Play: How It Shapes the Brain, Opens the Imagination, and Invigorates the Soul”, Stuart Brown tells a story about some difficulties faced by hiring managers at Jet Propulsion Laboratories (JPL), the organization whose technologies brought us the space age. Managers at JPL found during the late nineties that their recent hires in engineering and science roles couldn’t solve problems as well as their predecessors had. Managers had hired the best and brightest grads from the best schools, but managers found that the new generation of hires just didn’t measure up when it came to specific kinds of problem solving essential to the job. What was missing? JPL managers studied the problem and eventually concluded that they had left an essential ingredient out of the picture – play. They found that engineers and scientists who had “played” by taking things apart to see how they worked (like, clocks or home appliances) or built things with their hands like a stereo amplifier, had developed practical skills during their play that were essential to the kinds of problem solving JPL engaged in. Hiring managers adjusted by making questions about childhood projects and play a standard part of their interview process. When hiring, the management team selected candidates who had the sense of play that managers now knew to be connected to practical problem solving. Happily, their teams have continued to bring us the space age. I still enjoy watching video animations of the Mars Rover landing apparatus, designed by those JPL teams, landing and bouncing along like the child’s playful solution that it actually is. I was one of those kids who took things apart – alarm clocks and tube radios come to mind. I usually got them back together and working again. (But not always – sorry about that!) Visits to the junkyard were a cause for celebration for the imaginative stuff that could be discovered and hopefully brought home. Maybe you were that kid too? I’m laughing a little today, recalling those playful days. And I’m also recognizing the practical skills that I regularly enjoy in all manner of problem solving learned in part through that play. All of which raises questions worth considering: Do I (or you) play enough? In “The Basics of Nonviolent Communication” Marshall Rosenberg quotes Joseph Campbell saying “Never do anything that isn’t play.” I take that as an attitude of play, or bringing the essence of play into what I do. Which sounds great on the surface. It’s easy for me to see the core of my work as play, but how about the less interesting stuff? Is it “play” when I vacuum the carpet or dust my office? How about cleaning the roof gutters at home or running a plumber’s snake down a clogged toilet? (I wish that last one was only hypothetical.) Or updating my business book-keeping? I think Campbell and Rosenberg are on to something important about having a playful attitude – it would add a brighter quality to the work I do that seems dull. My challenge is in bringing that playful attitude into the things I just don’t like doing. “Never do anything that isn’t play. ”What does that approach to life mean to you? I’d enjoy hearing your thoughts in a reply – the comment section awaits you. My son and I laughed long and hard while the deer interacted with us. We laughed the next day about it and for weeks afterward. We still laugh about it now when we talk about that crazy deer. The encounter was so unexpected and paradoxical, so funny. I value the laughter we share, my son and I, and I credit our shared laughter with helping us through later hard conversations, back in regular ol’ city life. We may not have joined the deer in play – I’m cautious about wildlife interactions, but the two of us did get to benefit from a good long shared wilderness joke. It adds yet another strand to the connection between us. Want to read more about the science of awe, play and laughter? Here are a few resources and references from this article. Dacher Keltner at University of California Berkeley has been studying awe, play and other topics related to happiness. You can find Keltner’s thoughts about awe in a scholarly paper here: http://emotion.caltech.edu/dropbox/bi133/files/keltner.approaching-awe.pdf and in his 2009 book Born To Be Good: The Science of A Meaningful Life. Existential-Humanistic thought leader Kirk Schneider’s 2009 book Awakening to Awe relates in-depth stories about the role of awe in transforming lives. The 2009 book Play: How It Shapes the Brain, Opens the Imagination, and Invigorates the Soul by Stuart Brown examines play from a variety of perspectives. “We are built to play and built through play”, Brown tells us. This entry was posted in Existential, Practical Tips, Self and World, Uncategorized on November 24, 2014 by Stephen.